He said that many prisoners translate it to mean wide expanses of nature. ‘If you are spending part of your life surrounded by concrete walls, I think your perception of freedom would be nature-based,’ he said. These perceptions will be highlighted in an exhibition, Art from Inside: True Freedom, organised by the Mt Lawley-based fellowship. The exhibition features works created by adult prisoners living in jails across the state, with works centred on the theme of freedom. Mr Volmer said about 60 to 70 artworks were submitted into the competition, many of the entries focusing on nature as freedom. 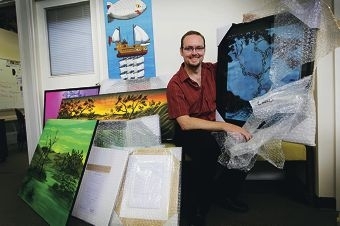 ‘Art work gives you a tremendous insight into the mindset of a prisoner,’ he said. The competition is part of a range of Prison Fellowship WA initiatives, including weekly visitations, prisoner and victim meetings and a camp for children of prisoners. The exhibition is at 38 St George’s Terrace, Perth until May 10.